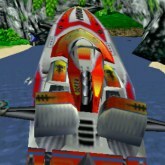 Description: Hydro thunder was a blast to play in arcades as well as N64 and Dreamcast. Select between a few different jet boats. All boats have strengths and weaknesses, so play with them all to find out which ones you like the best. The levels are a nice mix of jungle, snow, volcano and urban environments. Each level has boosts you can collect and secret areas. Some levels even have massive drops, like insane wow drops,lol. The game has good level progression and overall is a great racer that offers something different! Game Controls: Enter Key = Start Button. "W,A,S,D" Keys = Move. "K" Key = Accelerate. "Space Bar" Key= Boost. "L" and "I" Key = Change Camera View. Select option icons located at the bottom of the game screen to edit controls, Play In Full Screen, Save/Load game progress, and change graphics settings.